SNA Displays unveiled the highest-resolution LED screen in the history of Times Square with the debut of the newest large-format LED video spectacular at 701 7th Avenue. SNA selected Analog Way to provide a full 8K resolution processing solution for the massive wrap-around display, which showcases NFL Experience, a joint venture of the NFL and Cirque du Soleil. The 40-story high-rise at the corner of 7th Avenue and West 47th Street will house the Marriott EDITION hotel as well as many prominent tenants such as NFL Experience, an exciting new interactive fan attraction. The building features SNA’s wrap-around S|Video display canvas, one of the largest continuous exterior displays in the world representing more than 17,000 square feet of LED display technology. With 8K/60Hz processing, the screen is built to accommodate the next generation of video and broadcast media content. 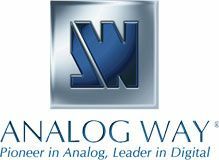 Analog Way had previously collaborated with SNA on several other high-profile projects, including the LED screens at the nearby 719 7th Avenue at Times Square, and the LED wall in the lobby of the Salesforce headquarters in San Francisco. Four Ascender 48 4K processors (ASC4806-4K-PL) deliver 16 feeds to the display, all with precise sub-frame level sync lock. Having precise sync lock on all 16 outputs ensures zero tearing of the image across the huge pixel space. The Analog Way processing solution is capable of working with a multitude of different sources, scaling any source type to any size on the LED display. This offers SNA and the screen’s tenant incredible flexibility and security since they are not tied to a single source device or format. “We can put a 4K source in the middle of the screen and surround it with traditional HD feeds and we’ll get pixel-perfect, clear imagery with the processors,” said Pat Green, Senior Director of Systems at SNA Displays. “That capability will likely help the owner land high-profile tenants for screen content. Who knows what the display will eventually be used for, but it’s clear that this screen is the only one in Times Square that can handle many of the modern demands of high-resolution TV and sports broadcasting." Using RCU hooks, the team was able to program the system remotely over an approximate three-week period.